If you are anything like me, you become overwhelmed with the how. To that I say, “stop overthinking and take action.” As I reflect on my empowerment journey, I’ll share a few pivotal moments that helped me spring into action. It is my intention that my story will help you get unstuck and take action in your own life. First… just say yes! to begin to activate your journey. I certainly didn’t plan to take this path. Instead, I stood with arms widespread and outwardly expressed to the Universe, “I am open to life’s possibilities”. It was then that Karen Pfeffer, co-founder of Fire Power Seminars showed up in my life. Instead of thinking, “Why is the happening to me?”, be kind to yourself and mindful of the lessons needed to learn throughout your process. Karen began coaching me, enabling me to become aware of my self-limiting patterns that were hindering me, and I began shifting my mindset. Like you, I knew there was greatness inside that I hadn’t unleashed. She equipped me with mindset tools I didn’t know I was missing and then, I began to experience the shift. 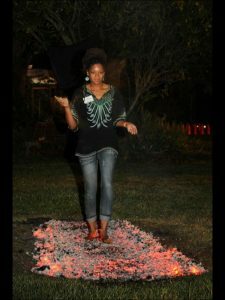 Many view the image of me fire walking – walking over 1200°F hot red coals – as a symbol of courage. The look on my face is one of deep thought and inner peace. Do you desperately want to embark upon the journey? Do you feel paralyzed by fear? (False Evidence Appearing Real) You are not alone. Some of us set the intention and grapple with the realization that great personal work is required prior to taking the first step. I invite you to engage in the process. Light your internal flame of personal empowerment and begin. Here’s a bit of insight into a four-step process that worked for me: Trust. Act. Support. Collaborate. Check it our for your self – go for it! I would say convincingly, “Trust me. You are ready NOW!” Truth is, building trust takes time. 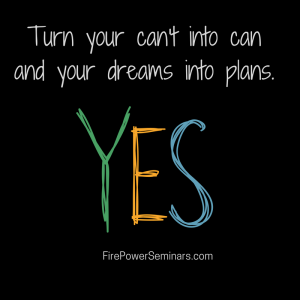 Remember, an empowerment process starts with an emphatic yes! and a personal commitment to the journey. During the weeks leading up to my firewalk, I didn’t know what I didn’t know. I had recently survived a stroke and completed all my therapies – physical, occupational and speech – yet, I wan’t fully comfortable speaking and using my new voice. Karen took notice and encouraged me to step into my power. 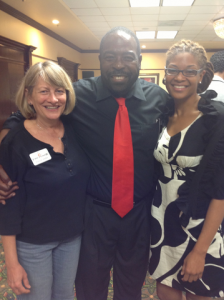 She informed me that Les Brown would be in town giving a 2-day seminar on sharing your story and that I needed to attend. I will admit, I wasn’t “all-in” at first. I didn’t know how to fully trust, yet I trusted her and knew she had my best interest at heart. Empowering and inspiring organization and individuals to realize their full potential is Fire Power Seminars’s mantra and that’s exactly what this women-owned and led company delivers. I had previously journaled “Surround yourself with people you genuinely trust. Those who believe in your vision. Those who will help you get unstuck when you’re at a crossroad.” And then, Karen shared that she would be my mentor. Recognize when your prayers are answered, when the Universe responds (Universe requires specificity), your intentions manifest. I move forward in complete trust, walking boldly in her “Step Into Your Power” arrow-breaking seminar, where I walk towards my desired outcome with an arrow pointed at my throat and walk towards my goal, as the arrow bends and snaps, reminding me that the arrow is “False Evidence Appearing Real” – that I can, and choose, to do things that appear impossible to overcome fear! Placing the tip of the cedar arrow against the hollow of my throat, I learned to clarify my goals, and focus my energy as I walked forward directly into the arrow. As the arrow shattered, I experienced breaking through a lifetime of self-limiting beliefs and fears! 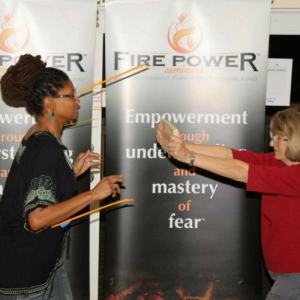 You too can experience powerful experiential activities in a safe and supportive environment where you will learn how powerful you truly are through a Fire Power Seminars Empowerment Firewalk Seminar (#SoFLFirewalk). 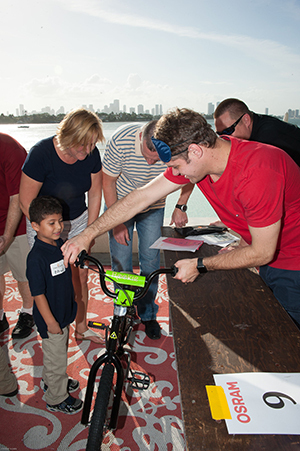 All activities are voluntary,. The founder, Connie Phelan, reinforces all activities with powerful presentations. Just say yes! to the process. Or, build your own empowerment seminar, choosing the activities from a broad menu of empowerment tools – you are totally worth it! Support is a two-way street. Remember, all things require balance: give and receive; yin and yang; the list goes on. Transformational coaching and customized seminars result in you becoming a better human being all around. The Women Empowering Women interactive platform has proven beneficial in my professional life involving metal wellness, healthy workplaces, company cultures and entrepreneurship. If you are seeking innovative ways to develop your team, or if you are a team member who understands the importance or working together inter-departmentally, allow Fire Power Seminars to help you break through silos and propel your company forward. Karen and Connie, the dynamic Fire Power Seminars founders, are exactly what I needed to supplement my recovery from a brain injury. Their teachings strengthened what I innately understood about the power of my mind. I’ve worked through their proven system and am overjoyed to share their offerings with you. “I found something that really works!” Engaging the mind and body! Karen stepped in at just the right time to retool my brain. After all, that’s what a stoke is – a brain attack! These services weren’t prescribed by any of my medical doctors. I was able to shift disempowering beliefs to empowering ones, pushing myself into a new positive belief system during recovery, constantly emphasizing that my thoughts and beliefs affect my reality, and that I am the one that gives definitions and meaning to my experiences in life – all of them! That was my “aha” moment! Karen and Connie are experts at delivering empowering experiences that last. Trust me, your soul will say thank you for saying yes! to the invitation. Take a peek at their work in action – and yes!, I’m sprinkled throughout the video clip.